The First National Swap Meet: For Collectors, By Collectors holds the biggest gathering of collectors of all kinds in the country on August 25-27, 2017 at Function Halls 1-3, SMX Aura, City of Taguig. 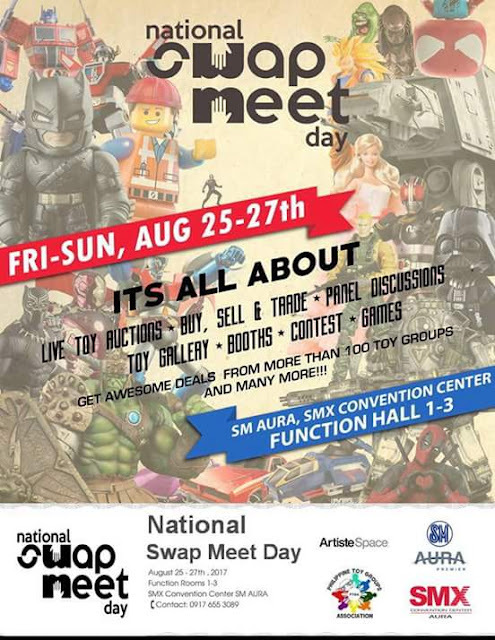 The event sets a vast display of various collectibles like toys, action figures, antiques, vintage items, books, prints, and unique curiosities await serious collectors and hobbyists for purchase, swap or auction. An exciting program of activities provides entertainment, fun and games, while various talks and workshops provide gainful information and new ideas in the world of collecting as a hobby. The venue becomes an ideal rendezvous for collectors meeting other collectors of similar interests. The event also exercises social responsibility through Toys For Marawi, an initiative of the Philippine Toy Groups Association that will donate toys for the children of Marawi. This activity aims to address the pressing need for mental stimulation and psychological healing for the children traumatized by the ongoing conflict in Marawi. “We are knocking on the hearts of parents and children in peaceful regions to donate used toys, but not toy guns or anything of the sort,” as requested by ARMM health secretary Kadil Sinolinding Jr. The First National Swap Meet is produced and organized by ArtisteSpace in collaboration with Philippine Toy Groups Association and the invaluable support of its partners – The Dark Knight PH, Toy Collector’s Lounge, SHFiguarts Philippines, Southside Transformers, Robot Pilipinas, The Mighty CollecTHORS PH, Red Toys, P.D.O.S., Digimon PH Collectors Club, TS 118, PH Star Wars Empire, Playmobil Collectors Philippines, Southern Dollies, Doll Collectors Swap & Sell, Dollvisoria, Barbie Filipino Friends, From Famous to Forgotten Super Robot, Vintage Voltes V DX Collection, Monogatari Series Philippines, MUSICars, PinoyLUG, Toy Collectors of Cavite United, Macross PH, KeithG Bricks, Voltes V Int’l Fan Page, SICness PH, DC Collectors Philippines, Pinoy Batman Kolektors, Gunpla Chuva, POSK & Juansix+ Let’s Volt In Group, DCPH, Comic Artists, Robot Collectors Haven, 3A Manila, Pinoy MInimates and sponsors – GSM, San Jose Builders, Taters and Chimara. For more information on ticket sales and sponsorship opportunities, visit the website at https://www.facebook.com/nationalswapmeetday/.